VERY MOTIVATE OWNER ON AN ELEGANT FULLY FURNISHED Grand Two-Story Home in Champions Gate. 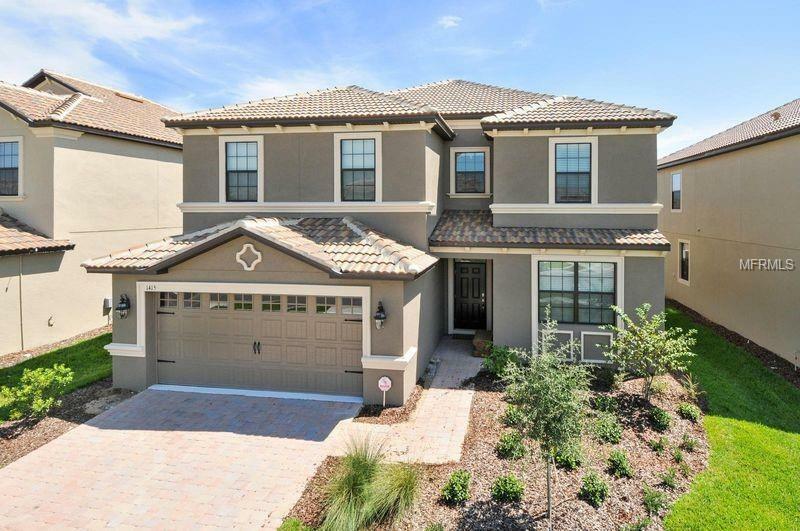 Much sought after 24 Hour Guard Gated community in the Orlando's metropolitan area. Two Spacious Master Suites and 3 Junior in-suite bedrooms; a total of 6 bedrooms and 6 bathroom home. Large Open Floor plan with Covered Lanai overlooking Private Heated Swimming Pool and Spa. Fully Equipped Kitchen with 42" Whitte Cabinets and Stainless Steel Appliances. Granite Counter tops in the Kitchen and all Bathrooms. Also included are Game Room, Media Room and in-home Security System. ADDITIONAL PRIVACY: NO Direct Back Neighbors. Champions Gate GRAND CLUBHOUSE with Concierge Services, WATER-PARK, Resort Style Pool, Spa, Lazy River, Water-Slides, Swim-Up Bar, Water Falls, Beach Entry, Splash Pad, Grill, Tiki Bar, Cabanas, FULLY EQUIPPED Fitness Center, Theatre, Games Room, Basketball Court and 7 Tennis Courts. Perfect to for relaxing with friends and families.